Aviation Updates Philippines - Both San Miguel Corporation (SMC) Chairman and Chief Operating Officer, Ramon S. Ang, and the Lucio Tan Group are currently holding talks for the full control of Philippine Airlines. SMC is in talks for the sale of the 49 percent stake in Philippine Airlines back to the Lucio Tan Group. According to Inquirer.net, the Lucio Tan group has been pooling funds to buy back a 49 percent stake in Philippine Airlines and reclaim management control from San Miguel Corp., which came in as a strategic partner in 2012 to support the carrier's modernization and refleeting program. 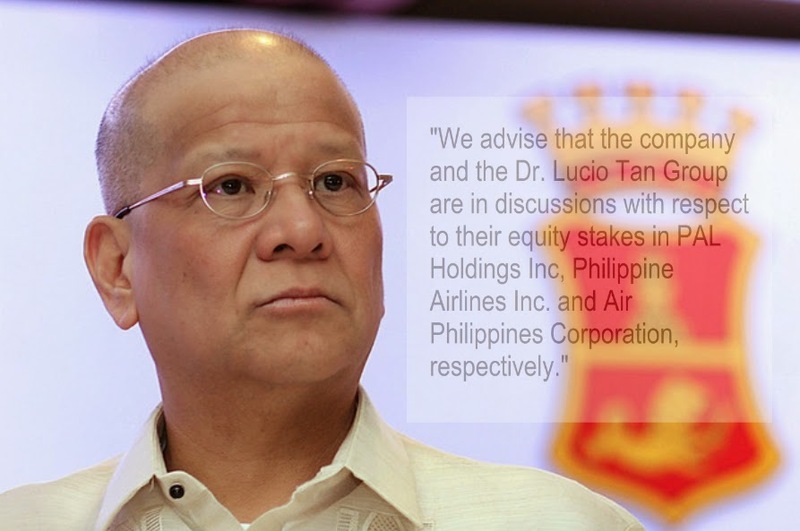 "We advise that the company and the Dr. Lucio Tan Group are in discussions with respect to their equity stakes in PAL Holdings Inc, Philippine Airlines Inc. and Air Philippines Corporation, respectively," San Miguel Corporation told the Philippine Stock Exchange on Monday. The PAL Holdings Inc., which operates the Philippines' national flag carrier and PAL Express, is currently being owned by Lucio Tan (51%) and Ramon S. Ang (49%). "An appropriate disclosure shall be made in the event a definite agreement is concluded by the parties," SMC said. The disclosure was made in response to reports that the Tan group is moving to regain Ang's minority stake which was acquired after San Miguel Corporation infused $500 million in 2012 for Philippine Airlines' modernization and refleeting program. However, the San Miguel stated in a disclosure on June 10, 2013 that the company, San Miguel Corporation, is not interested in buying Lucio Tan's 51% stake on Philippine Airlines. SMC had been advised by the Lucio Tan Group that latter is in talks with a group of investors who have expressed an interest to purchase such majority interest of the Lucio Tan Group in PAL Holdings Inc.
On December 20, 2013, a report was published in the Aviation Updates Philippines' website that Ramon Ang is not interested in buying Lucio Tan's 51 percent stake in Philippine Airlines. "We are not in talks to buy Lucio Tan's 51% stake in PAL," Ang said in a text message to ANC. Philippine Airlines, as Asia's first and the oldest airline, currently operates two Airbus A319-100, ten Airbus A320-200, seven Airbus A321-200, eleven Airbus A330-300, eight Airbus A340-300, two Boeing 747-400, and six Boeing 777-300ER.